The National Weather Service is keeping an eye on blazes to the south, east and north of the Puget Sound area for a possible return of the smoke next week. Washington state has had more wildfires this year than ever before. 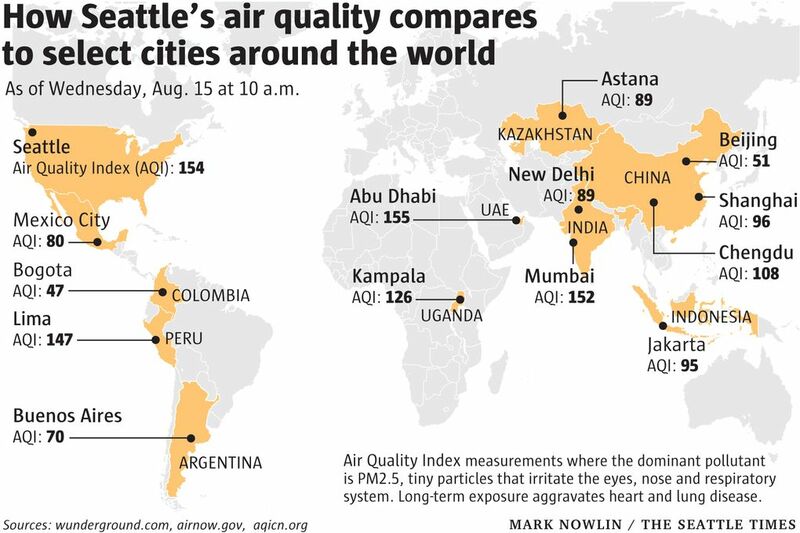 How unhealthy was the air Seattle residents were breathing Wednesday? Worse than that of Beijing, by far. The Environmental Protection Agency’s air-quality index posted a reading of 170 for Seattle as of 2 p.m. Wednesday, well into the “unhealthy” category. The reading on Weather Underground, a website that tracks weather data around the world, was 154. That compares with just 16, or “good,” for the Chinese capital that has built a reputation for having some of the world’s most polluted air. 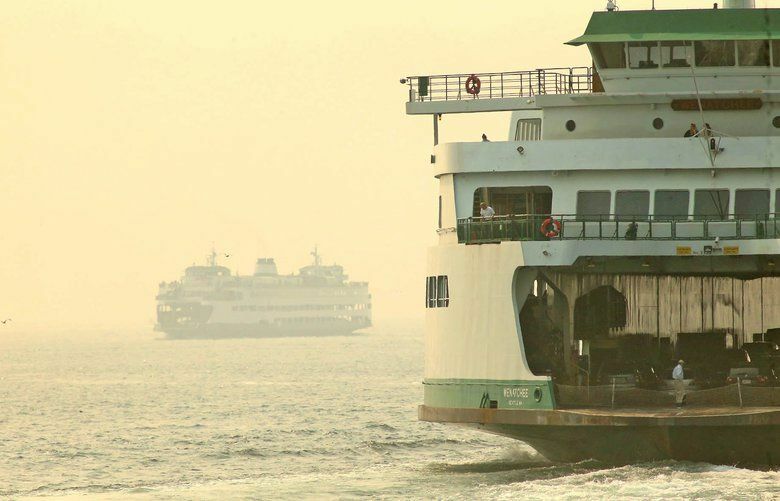 But a push of marine air into the Puget Sound was expected to start Wednesday evening and clear some of the smoky haze from wildfires to the north, according to the National Weather Service. Washington state has had more wildfires this year than ever before, with 939 fires involving more than 34,000 acres on land protected by the Department of Natural Resources, according to Janet Pearce, a spokeswoman for the state agency. The number of wildfires is 15 percent higher than the state’s annual average over the past five years, she said. “We’re in for a long season,” she said. The EPA’s air quality index forecast for Seattle calls for a drop to a reading of 72 on Thursday, which means “acceptable” for most people. Smoke that settled in the region since Monday had lowered visibility to as little as 3 miles by Wednesday morning. Visibility improved to 5 miles in the Seattle area on Wednesday afternoon, but was still short of the 6-mile range for Beijing, according to Weather Underground. “The wind will scour out and clean the worst of the smoke, but won’t completely get rid of it,” National Weather Service meteorologist Danny Mercer said. And our bodies react the same, too, in the short term, he said. What is the EPA's AQI? The Air Quality Index (AQI) is an index for reporting daily air quality. It tells you how clean or unhealthy your air is, and what associated health effects might be a concern. The AQI focuses on health effects you may experience within a few hours or days after breathing unhealthy air. 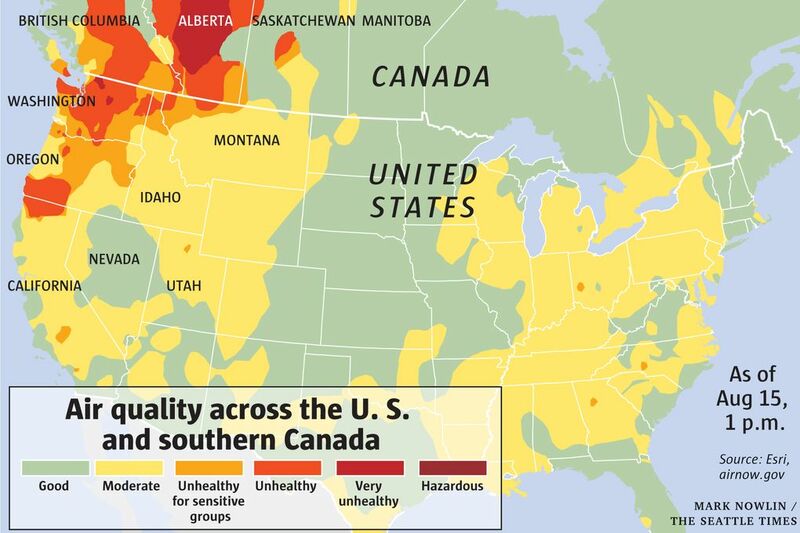 The AQI is calculated for four major air pollutants regulated by the Clean Air Act: groundlevel ozone, particle pollution, carbon monoxide, and sulfur dioxide. The small particles go to “deepest parts of your lungs,” triggering an inflammation response from the body, he said. That response can increase your heart rate and blood pressure. Saganić recommends people stay indoors and close your windows and doors — if you’re among the few with air-conditioning in the region. If you can’t hunker down and bear the heat, he suggests spending a few hours in an air-conditioned place, like your apartment lobby or a library. Wearing a mask can also help, just be sure to use one ranked N95 or higher. 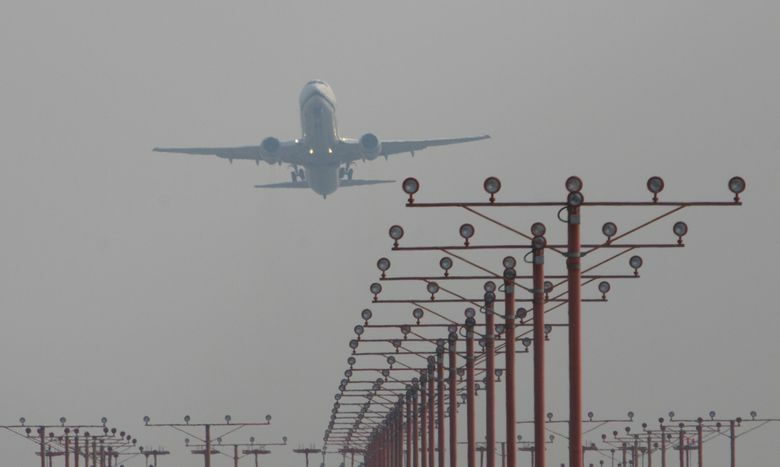 Because of the smoke, which acts like a blanket between the atmosphere and the earth, temperatures were a few degrees cooler this week than the 90-plus degrees the weather service had predicted for Seattle-Tacoma International Airport. Temperatures are expected to drop a bit on Thursday and Friday, as the region trends back toward its normal high of the mid- to upper-70s. Both days are expected to feature morning clouds and afternoon sun, Mercer said. “If the winds are not from the west, it could be smoky next week,” he said. Canada’s province of British Columbia has declared a state of emergency due to hundreds of wildfires burning across its lands. Smoke from those fires has drifted south, hurting air quality in areas including the Puget Sound. Public Safety Minister Mike Farnworth says Wednesday’s declaration applies to the entire province and ensures federal, provincial and local resources can be delivered in a coordinated manner. The province says 566 wildfires were burning across British Columbia on Tuesday, with evacuation orders covering more than 1,500 properties and affecting about 3,000 people. The wildfire service says more than 1,800 wildfires have been recorded since the season began on April 1, charring nearly 1,500 square miles of timber and bush. The federal government has approved the deployment of about 200 members of the armed forces to help with firefighting efforts.